I’m on tour! An article about my upcoming Diary of a Mall Girl events, with dates, is now at the Reading Agency. √ Wednesday 17 April: Swindon – Thanks a lot to Swindon Libraries for arranging a brilliant school event and for this lovely writeup! √ Thursday 18 April: Bristol: Central Library, College Green, Bristol, BS1 5TL. Time: 1900. 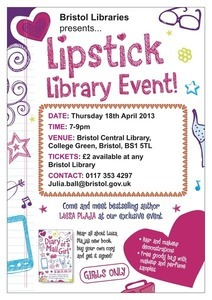 We had a brilliant night at Bristol Central Library, with great hair and beauty demonstrations, and we took home fab goody bags with makeup, perfume and beauty samples. Huge thanks to Bristol Libraries, Alan Bendrey & Co Hairdressers, Durdham Down Bookshop and Curious Fox Publishing. 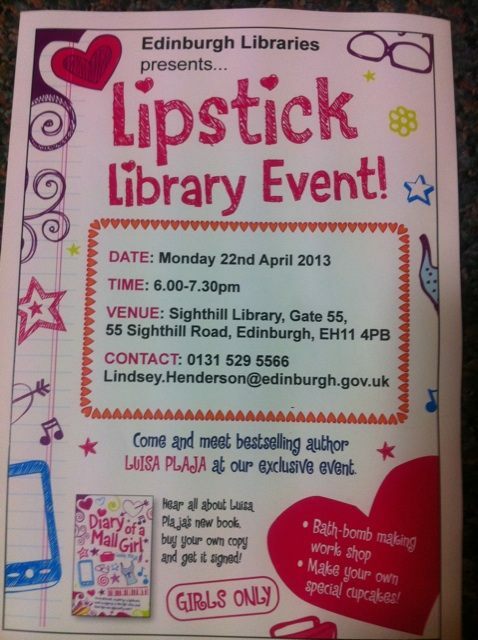 √ Monday 22 April: Edinburgh: Sighthill Library, Edinburgh, EH14 2ST. Time: 1800. An amazingly large group of brilliant girls joined me for a fun night of Lush bathbomb-making, delicious cupcakes and fun. Thank you, Lush and Edinburgh Libraries! Read a write-up of the night – with pics – by Edinburgh Libraries. √ Thursday 25 April: Barnstaple: Barnstaple Library, Tuly Street, Barnstaple EX31 1ELY. Time: 1830. Wow, what a night – there was so much going on. Hair and beauty sessions, a nail bar, massage, a free smoothie bar, a raffle… and more. I took my daughter to this one and we both had a wonderful time! Thank you, Devon Libraries, Petroc, Waterstones Barnstaple and everyone else who made this such a great event. √ Tuesday 30 April: Wirral: Bromborough Library Wirral Council, Room F04, Municipal Building, Cleveland Street, Birkenhead, Wirral CH41 6BU. Time: 1800. 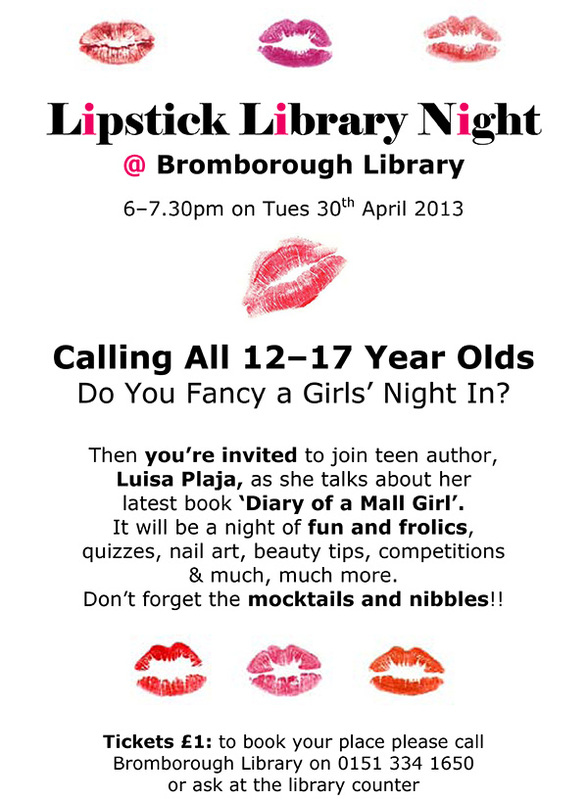 I met so many fantastic people at Bromborough Library! There were lots of fun competitions and makeovers going on, plus wonderful mocktails and nibbles. Thank you for having me, Wirral Libraries! Read more about it at Cheshire Today. √ Wednesday 1 May: Chester: Chester Library, Northgate Street, Chester CH1 2EF. Time: 1800. A brilliant night out in gorgeous Chester – even the sun made an appearance! There were pink drinks, cupcakes and lots of beauty advice from the Body Shop. I loved meeting everyone who came to this event! √ Wednesday 15 May: Stockton-on-Tees: Stockton Central Library, Church Road, Stockton-on-Tees TS18 1TU. Time: 1830. What an amazing night I had at Stockton Central Library! More than 60 teenagers joined in with a night full of Wii Dancing, henna tattooing, nail decoration, felt bird-making, beauty tips from The Body Shop, refreshments and loads more! So much fun. Thank you, everyone! √ Thursday 16 May: Newcastle: Newcastle Libraries, Adult and Culture Services, Charles Avison Building, 33 New Bridge Street West, Newcastle upon Tyne NE1 8AX. Time: 1800. Click for details. I absolutely loved the hair demonstration at this event – I learnt loads, including the fact that fishtail plaits are hard to do. It was also great to meet representatives of The Body Shop and Top Shop and to chat to everyone who attended. A brilliant night out in sunny Newcastle! For more overall information about the Lipstick Library tour, please contact Juliana Oliver at The Reading Agency. **STOP PRESS*** Watch out for me at The Hay Festival, where I’ll be part of an event called “It’s a Girl Thing”, together with authors Sophia Bennett and Sarah Webb. The event is on Tuesday 28th May at 1pm. 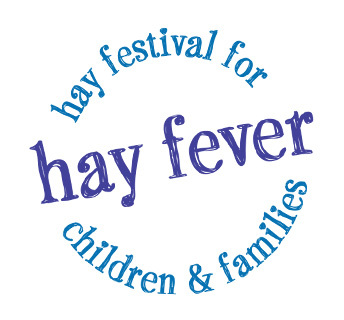 Find out more at The Hay Festival. Read Sophia Bennett’s post about it here!